If you’re looking for ROI gains and you’re not sure what areas to test first, start with headlines or subject lines. The impact of headlines on conversions is no secret, but the ease of testing (no design, coding, etc.) makes them even more valuable. Caveat: Creating and testing effective headlines can be deceptively simple. There’s much more to them than slapping a catchy subject line on an email blast, or cramming keywords into PPC ads. The real challenge lies not only in crafting successful headlines, but using them to conduct effective tests. The research brief below, drawn from our free Web Clinic on August 27, 2008, explores the objective and key qualities of successful headlines, presents case studies and examples of strong and weak headlines, and offers step-by-step methods you can use to test and optimize your own headlines. In the volumes of information and how-to guidance on writing strong headlines, one fundamental principle is too often overlooked. The objective of your headline is not to sell, but to connect with your reader. It’s easy to lose sight of this objective with headlines  especially when marketers and copywriters are under intense pressure to increase revenue. There are so many competing messages, and just a handful of words to work with in PPC ads, email subject lines, press releases, and landing page headlines, that the temptation to produce headlines that “sizzle” can be irresistible. But that approach is increasingly shunned (or deleted) by post-modern consumers, who are inundated with more than 600 marketing messages per week, have less time to read than ever before, and are deeply skeptical about sales and marketing pitches as it is. When we’re focused on the end result, we tend to ask headlines to do too much  and run the risk of overshooting the mark. On the other hand, twisting our headline copy to placate search engines and spam filters can lead to keyword-laden, uninteresting language. The headline draws your reader into the next line (subhead). The subhead connects them to the first paragraph (copy). The first paragraph engages them with your offer. Let’s look at some examples of how different headline styles can be tested and used effectively in this way. Case Study #1 (PPC Ad): Statement or Question? We conducted a test with a research partner to increase the clickthrough rate of a pay-per-click campaign. a statement or a question? This test split traffic evenly across a PPC ad group with four iterations: one question-style headline, and three statement-style headlines. For this case study, we will focus on the two ads from this group that performed best. What you need to understand: The control ad (question style) outperformed the treatment ad by 36.18% in clickthrough rate. Case Study #2 (Landing Page): Headline or Design? Sean Tierney of JumpBox, Inc. conducted a series of A/B tests to improve conversions of a PPC landing page. The vast majority of the page retained the same design and copy. Headline and subhead changes were the most significant factor. For this case study, we will examine the control and the final test version of the landing page. What you need to understand: The redesigned landing page outperformed the control by 87.61% in conversion rate. Case Study #3 (Email): Which Style Works Best? We conducted a split test of three email subject lines using the invitation for this clinic. Primary research question: Which subject line would achieve the highest open rate? Secondary research question: Which subject line would achieve the highest clickthrough rate? Approach: This A/B/C test went to three groups. Subject line A used our standard language style and format. Versions B and C tested different angles. Body copy was the same for all three emails. Impact of the front-end introductory text (“Web Clinic”) vs. the topic-only style. Impact of time indicators (clinic date, use of “next”). What you need to understand: Version C outperformed both Versions in open rate by 5.9% (relative increase), and achieved the highest click rate (tied with Version B) . Also, the clickthrough rate of Version C was 11.1% higher than Version A, the “control” in this test. Version C was also forwarded 24.2% more often than the other versions. When headlines and subject lines apply these three qualities, they are more apt to connect with the reader – which is the true objective. Here’s an example of a real headline and copy combination that follows the three keys and the principle of connecting with readers. It’s not the most clever or catchy language; however, it is clear, relevant, and uses the supporting information to shore up its claims. Headline on the homepage describes value proposition and the guarantee as a compelling “hook” to continue reading the intro copy and start searching for a product. Intro copy re-emphasizes guarantee with additional clarity and in a concise way lets the customers know what the company is about and what they have to offer. Picture of person pushing someone in mobility product adds a “personal connection” to the intro copy and draws the customer’s eye to that section. Value proposition points are displayed clearly under copy and within the fold. Text has been added below the product in case the type of product they are looking for is not listed in this section. The following examples illustrate the importance of clear, relevant headlines, regardless of whether theyre found on a homepage, PPC ad and landing page, or in natural search engine results. Strengths: Direct, concise, specific, newsy. Subhead gives two key benefits. Strengths: Keywords + energy + brand + value proposition, expanded upon in the subhead (description). Weaknesses: Informational, lifeless headline relies too heavily on brand recognition and tries to use subhead to allay concerns of anxious target audience. Weaknesses: Branding-based PPC ad title is followed by weak declarative headline hidden in the design and less compelling than subhead. Does not connect with the PPC ad language clearly enough. If you’re willing to invest some extra time and effort to produce stronger headlines, consider the following two approaches. Used separately or in tandem, these methods can improve headlines by providing you with additional perspectives: including “preview” feedback from your target audience. 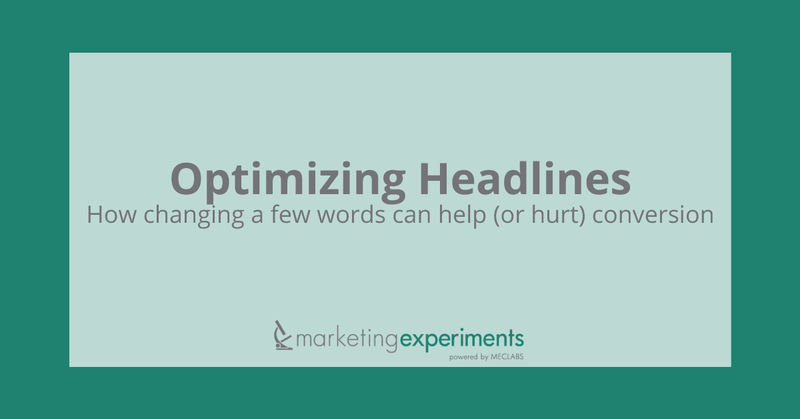 For each headline you need, write 10 different headlines using a wide variety of angles. Get feedback from colleagues, tweak as needed, and whittle the headlines down to the top three. Take a sample from a few top customers or external peers. Ask them to pick their favorite, rate the headlines on a 1 to 5 scale and/or tell you what they did and didn’t like. Do this via email, IM, Twitter or phone – but don’t wear it out. Use email to A/B test the top two headlines to a small but valid segment of your list (1,000-2,000 names). Apply the winning headline to the full send, or test again. Use PPC, email, site pages, optimized PR to complement each other for testing headlines with different lengths and styles. PPC ad titles force you to write short, while email subject lines and site page/article titles allow for longer headlines. Insert the strongest words from PPC ads into email. Test email subject lines in PPC ad copy lines 1-2 (keeping the title and URL the same to isolate the impact). Use headline-style links in online press releases, not “click here” or raw URLs. Track clicks on blog links and your site content for clues to language to test in headlines. If you’re looking for ROI gains, a variety of headline and subject line test methods can provide a significant impact at minimal cost. The objective of a headline is not to sell, but to reach out and connect with the reader, and pull him or her into reading more. Three key qualities of successful headlines: clarity, relevance, and credibility. As part of our research, we have prepared a review of the best Internet resources on this topic. These sites were rated for usefulness and clarity, but alas, the rating is purely subjective.